FQCH-HC-600/700 Computer Hot-sealing and Hot-cutting Vest Bag Maker-Sanyuan plastic packing machinery co.,ltd. This machine is suitable for Hot-sealing and Hot-cutting HDPE and LDPE plastic film. It adopts computer color code-tracking,hydraulic punch the "U" shape vest bag in one time ,it is a special bag maker for producing vest bags. And with such features,such as easy operation and high finished products,so the production efficiency can be improved greatly. 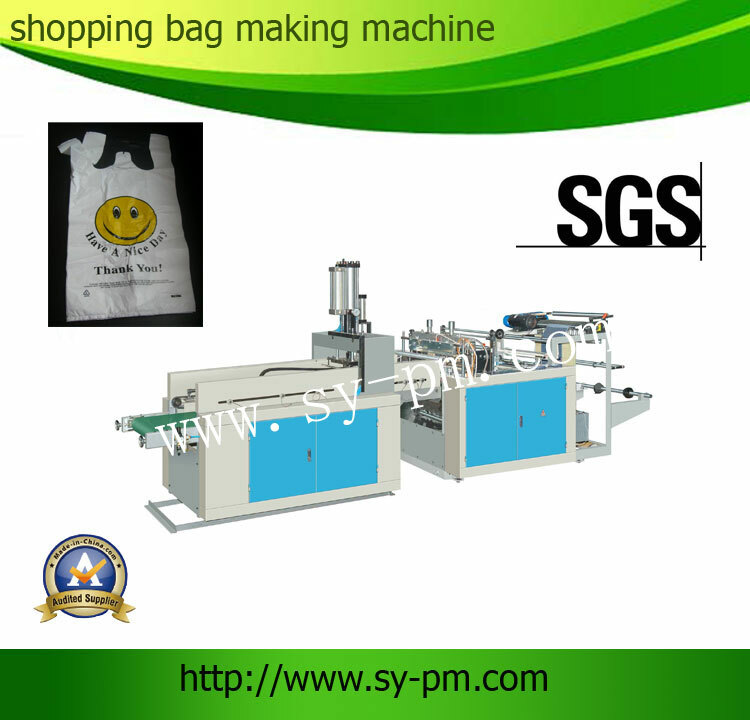 1.Usage: FQCH-HC model bag making machine is suitable for making print bags or no-print bags. 2.Double line production system: this machine can produce print or no-print bags by one production lines. 3.Fully automatic: it can do one-line production of the following steps: heat 4.sealing, heat cutting, punching, sending bags out by conveyer belt. All the above steps is done by one machine. 5.Double punch: Two air cylinder devices will be installed on the machine to do “U”shape cutting with heavy power. Moreover, two “U”shape knife will be installed on the machine to do two line punch production easily. .7.photo cell: the photo cell will be installed on the sealing and cutting unit to track the print mark for print bags in two production line. 8. Its machine has the following features: automatic temperature control, driver, sealing knife, automatic counting system, alarm system.